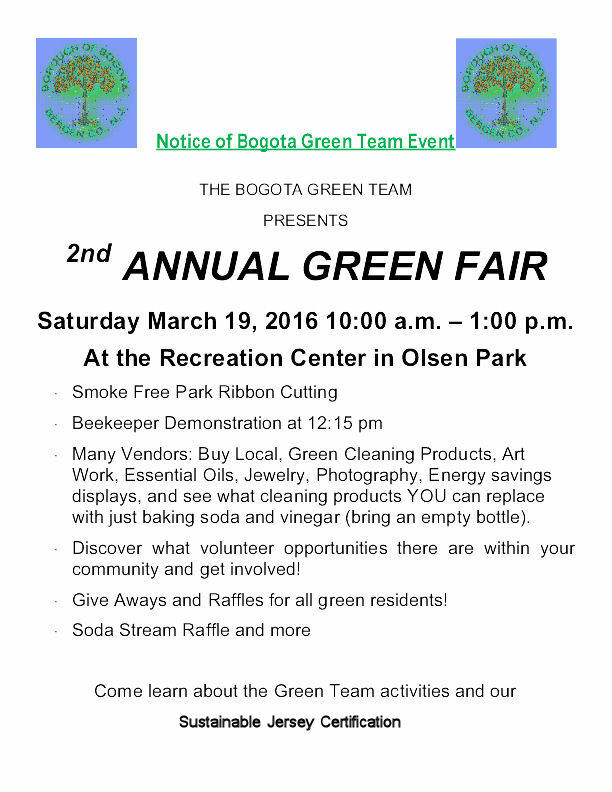 On Saturday 19-March the Bogota Green team will hold it's second annual Green Fair. This will take place at the picnic pavilion and in front of the Recreation Center in Olsen Park. This is a free event open to the public. It will start at 10:00a and run until 1:00p Some articles include an official opening of a smoke free Olsen Park. In April of 2015 the Bogota Borough Council voted on an ordinance that now prohibits smoking in all Public park and other Public recreation areas. There will be a display and demonstration by the the NJ Beekeepers Association on the benefits of bees to the State of New Jersey. 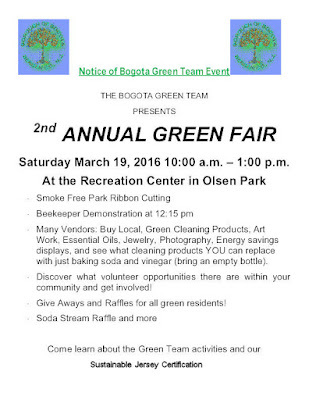 The Bogota Green Team will provide a safer alternative to chemical cleaners by using Baking soda and vinegar .This cleaner will be provided free to anyone who brings their own bottle. Bottles should be new, or fully cleaned of any old liquids. There will also be a number of displays, and vendors in attendance. Some of those will be Bogota Beautiful, Lewis Marx Pottery, Beach Body Fit . Bogota Blog NJ will also be present at this event with a select numbers of photos and other items available for sale. This Green Fair is another part of the Bogota Green Team effort to help Bogota improve their Sustainable Jersey Certification. With a higher Sustainable Certification the Borough of Bogota could become eligible for grant funding to help obtain a cleaner, and safer standard of living for it's residents.